William pear is a very tasty variety. Its flesh is juicy and particularly sweet. The one contained in your carafe comes from an orchard of Maine et Loire. In the spring, carafes are hung on the pear trees so that the fruit ripens inside the bottle. They are held with nets. During harvesting, a sorting eliminates poorly formed fruits. 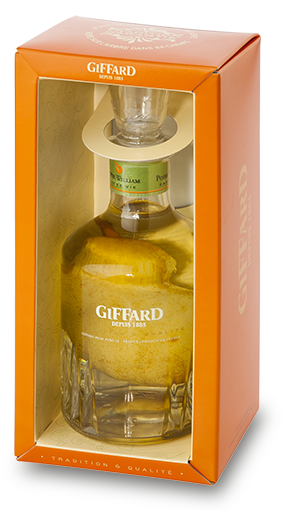 Fruit after several successive bath, are then covered with a carefully selected Poire William brandy. Neat on the rocks as a digestive.